Jeremy Hunt Wins 'Patient Safety' Award – Why and How? By TruePublica: Here’s a story the press should have jumped all over in Britain but not one put a single column inch to it. The ‘alternative’ media also got the wrong story. No, it’s not satire, it’s true. Previous winners of the award include; President Barack Obama, Vice President Joe Biden and Dr. Patrick H. Conway – all of whom worked towards free and equal access to healthcare services in the US. Not that it did any good as most of their work was undone by the arrival of Donald Trump. In the meantime, Jeremy Hunt has another award. He was already the most disliked frontline British politician by some margin, a poll showed back in 2016. Since then, he’s graduated from being a general all-round bad guy and simply disliked and morphed into a hate figure today. At the time the YouGov poll found that Mr Hunt was substantially more unpopular than George Osborne! Back then, Just 17 per cent thought Mr Hunt was doing well while 65 per cent believed he was doing a bad job as Health Secretary. After the catastrophe of the NHS winter crisis this year, anyone thinking Hunt is doing a good job must have some sort of serious cognitive impairment. A recent poll fro the beginning of 2018 has determined that of Conservative voters, more than 60 per cent think Hunt should be sacked. However, the World Health Organisation has a different opinion. 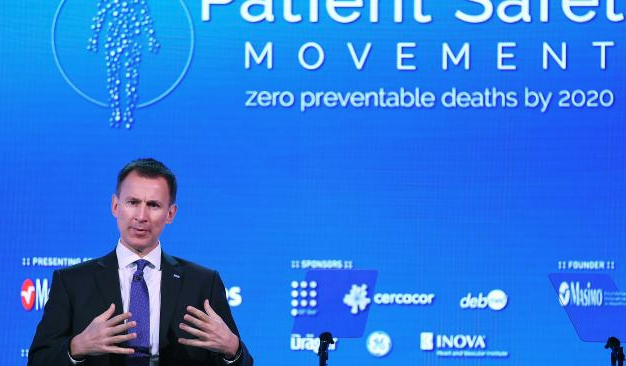 On the 23rd February this year, at the 6th Annual World Patient Safety Summit, Dr Tedros Adhanom Ghebreyesus, Director-General of the World Health Organization made a speech that paved the way for Jeremy Hunt’s award. Contrary to what most Britons know about Jeremy Hunt’s performance as the man in charge of the National Health Service, the WHO believes he deserves nothing less than divine status as representative from on high. However, there is a reason why they should think this and they sound pretty reasonable, even if the award itself is totally misguided. Here are some extracts from the speech Dr Ghebreyesus made. None of this was in any media let alone the mainstream. That Britain is a ‘role model for the world’ when it comes to patient care is something all citizens of Britain should be proud of. But the reality is that every year, millions of patients die or are injured because of unsafe and poor quality health care. Most of these deaths and injuries are totally avoidable. Adverse events are now estimated to be the 14th leading cause of death and injury globally. That puts patient harm in the same league as tuberculosis and malaria. There are an estimated 421 million hospitalizations in the world every year, and on average, 1 in 10 of those results in adverse events. This is why we say that universal health coverage and health security are two sides of the same coin. When health services are not available, or not affordable, or not safe, the conditions are ripe for disaster. And of course, the economic costs of medical errors are astronomical. About 15% of all hospital activity and expenditure is a direct result of adverse events. And the costs of treating safety failures amount to trillions of dollars each year.Globally, the cost associated with medication errors alone has been estimated at US$42 billion annually. There is no silver bullet for patient safety. There are no short cuts, no quick fixes. Instead of attributing the positive outcomes in Britain as a result of a decades long effort by the National Health Service, despite the current onslaught of the current political market based ideology of the Tory party, the NHS struggles along, fronted by some of our best and politically kicked around by our worst. No-one should forget that Jeremy Hunt co-authored a policy book that called for the NHS to be replaced by an insurance system. The 2005 policy book, called Direct Democracy: An Agenda For A New Model Party, was a collection of writings authored by a group of Tory MPs. Having got into power, it has been evident to all those with an internet connection that the current incumbents in No 10 Downing Street were going to use their free market model over the NHS. It’s now got so serious that legal action is being taken against Jeremy Hunt and the Department of Health over their proposals to restructure the NHS. The Independent revealed just three months ago that plans have been tabled to convert the NHS into a public/private enterprise, which critics say is based upon the US private health insurance-based system. That report is a truly shocking indictment of people like Jeremy Hunt when it comes to the future of healthcare in Britain. The legal challenge is based upon the fact that the consultation process was limited, inadequate and unlawful due to the lack of national consultation or parliamentary approval. The NHS is fully deserving of this award – Jeremy Hunt is not. The World Health Organisation should show some respect to the genuinely hard working people involved in what they confirm is the best healthcare system when comparing it globally. The government should also remember that consistent polling has shown that while attitudes to the NHS have fluctuated over the years, commitment to its founding principles has remained remarkably consistent. When asked which British institutions Britons were most proud of, the NHS ranked first, the British army ranked second and the monarchy third. Over Seventy per cent of people have declared the NHS to be a symbol of what is great about Britain year after year. They have not given a mandate to any political party to dismantle it.